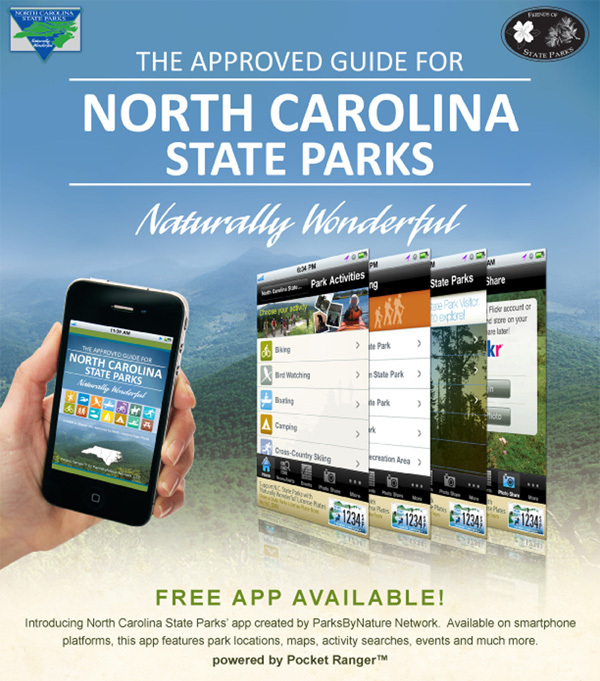 North Carolina State Parks, Friends of State Parks and ParksByNature have combined to produce a free comprehensive mobile app for iPhone, iPad and Android. Get complete information about parks, facilities and trails as well as detailed park and campground maps. GPS-based features also allow you to mark waypoints, record hikes and connect with friends. And, you can download maps before you venture into the state parks.Our mobile app is constantly being improved with updates. To download the free mobile app for iOS and Android smartphones, just click here. What about one for iPads? The app is developed by a private contractor, Pocket Ranger, and for whatever reason they have not elected to create one specifically for iPad, perhaps because many of the features used in the field requires a cellular connection.